There was something in the moody and dogged silence of this pertinacious companion that was mysterious and appalling. It was soon fearfully accounted for. On mounting a rising ground, which brought the figure of his fellow-traveler in relief against the sky, gigantic in height, and muffled in a cloak, Ichabod was horror-struck on perceiving that he was headless!—but his horror was still more increased, on observing that the head, which should have rested on his shoulders, was carried before him on the pommel of his saddle . 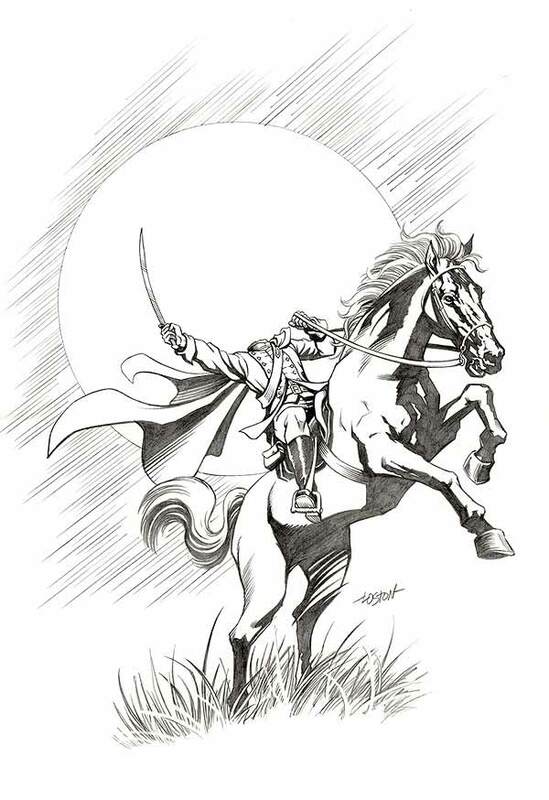 . .
– from “The Legend of Sleepy Hollow,” Washington Irving. Autumn is the season of ghosts and goblins, of witches and witch’s brews, and of all manner of supernatural goings-on. Halloween is in October for a reason. As October keeps its annual appointment, nights begin to chill and leaves begin to turn their familiar hues of browns and yellows and reds. Evenings shimmer in ever-earlier twilight; sullen smoke from a warming campfire rises in the distance on the edge of a woods. The disturbed rustling of leaves in a barely-moving breeze—faintly illuminated by the clear, cold moonlit sky—somehow commands a greater attention at the crest of autumn than it would on a midsummer night’s evening. It is at this time of the year that one finds himself in this land between the living and not-so-living, between the real and the imagined. He may wrestle with unaccounted-for trepidation—perhaps outright fear—gripping his soul in a manner only possible in this season of unrelenting decay and unyielding march toward the dead of winter. It is while thoroughly embedded in this backdrop that I took a long walk the other evening. With the sun setting so much earlier now than just a few weeks ago, it is quickly becoming impossible to do the things I most love to do—things that require daylight hours well into the evening, namely kayaking and bicycle riding. The kayaking is all but gone now, though I will extend it as far as I can into the shoulder season. By November, my bicycle riding will be consigned to weekend afternoons, at least for as long as the weather holds out. With any luck, I may be able to ride up to Thanksgiving. In any case, I am slowly becoming resigned to the evening outdoor walk, the exercise of desperate last resort. So I found myself walking along a country road that eventually lead me to a foreboding, unlit bicycle path. The path rambled on for a couple of miles through an area of thinly-spread structures and sparse human habitation. About half-way into the evening’s trek, I came upon a wooden bridge that traversed a nearly-forbidding marsh—a lowland of odious hospitality. The bridge was long and narrow with vertical-slat railings on both sides; it had barely enough room for two bikes to pass in opposite directions. On this evening, though, I was all alone—no bikes or walkers or joggers to be found anywhere. As I started out across the bridge, my thoughts ran to Sleepy Hollow and Washington Irving’s vivid description of the headless horseman. I had already stepped onto the bridge, affirming my commitment to cross it; so I continued on, quickening my pace and finding myself glancing over my shoulder with a neurotic frequency. In my mind’s eye, I imagined the headless horseman at the foot of the bridge. He sat upon the largest black horse I had ever seen. Steam billowed from the horse’s nostrils, filling the evening’s cool air around the four-footed beast’s head. The horse was chomping on his bit, barely restrained as he anticipated the command from his master to charge forward onto the bridge to terrorize the unfortunate soul that lay before him. Of course, this scene played out only in the depths of my imagination. The reality was that I never saw the headless horseman that night. In spite of my preoccupation with him, he would have to wait for my dreams to make his horrific appearance. However, the truth is that I did keep glancing over my shoulder as I crossed the bridge as quickly as possible. For one never knows when his imagination may get the best of him! Originally posted in October of 2010. I thought it was worth a repeat.